Watch tutorial of You Tube Videos. The video states see video 2 for other attachment however no other video exists as of yet. 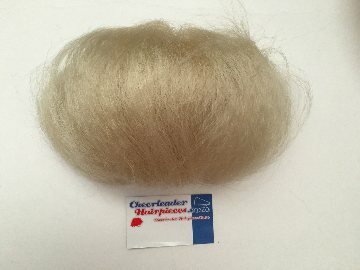 This is not a hairpiece. It sets under a bun cover Hairpiece to give the hairpiece more hight on styles like the Sabrina, Goddess, Charmed, Elite. These are large net hairpieces. The item is Great for girls with small buns to fill in any hairpiece net size. You can simply wrap it around the childs bun, its cut to fit. We do not suggest removing the rubber bands on both sides of the item to trim just roll up the rubber band and cut below it. We do not suggest using any stuffer like the tease ball or bun tucks to over stuff a wiglet as this will break down the netting fibers. This style comes in a straight form as seen in the video. Please Match my Hairpiece ! We carry several colors and will match to your hairpiece the best we can. If you order over 1 hairpiece and order 1 tease ballwe will send whatever so choose a color in stead.